A single-drop DNA test invented by UQ scientists could revolutionise the detection of diseases in humans, livestock and crops. The test works in a similar way to a pH test for swimming pools and gives a result in 90 minutes. It has been developed by researchers at UQ's Australian Institute for Bioengineering and Nanotechnology (AIBN) and the School of Agriculture and Food Sciences. AIBN's Professor Matt Trau said the test detected viruses, bacteria, fungi or parasites in humans, crops and cattle and could be used by health workers or farmers in the field – saving lives, time and money. "We've been able to take what would usually be done with complicated equipment in a centralised laboratory and miniaturise it into a single drop of fluid that farmers, for example, can use to get an almost immediate result in the field," Professor Trau said. The test uses a single drop of liquid that changes colour if the test is positive. In its current form, the test can be made sensitive enough to detect even the smallest trace amounts of DNA or RNA, and it can also scan for multiple pathogens (bacteria, viruses and other micro-organisms that cause disease) or cancer markers. 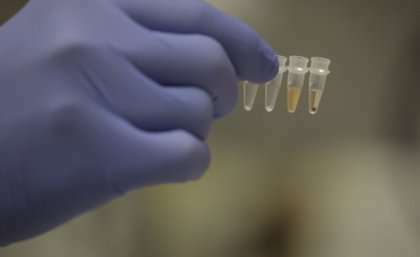 "We can now detect as little as just a few molecules of DNA in almost any sample such as blood, saliva, or even soil. "This part is particularly exciting for many future applications," Professor Trau said. The test has already proved accurate in detecting human diseases such as HIV, malaria, tuberculosis the H1N1 influenza virus, as well as E. coli in water, bovine herpes virus in cattle, and fusarium fungus in crops. UQ School of Agriculture and Food Sciences Professor Jimmy Botella said there were virtually no limits for potential uses for the technology. "This new test is especially suited for developing countries, but it will also be very useful for the Australian agricultural and livestock industries as it provides a fast method to detect diseases without the need to send samples to the laboratory," he said. "We expect that the technology would also be beneficial to the Australian Customs and Quarantine services and the Australian export industry as they could test produce in the packinghouse before shipping. The technology will soon be trialled in Cambodia to test for food pathogens, in a project led by Professor Botella with support from the Australian Centre for International Agricultural Research (ACIAR). Other key researchers involved in the project are inventor Dr Eugene Wee and PhD student Han-Yih Lau. The research features on the cover of the latest edition of the Royal Society of Chemistry's ChemComm journal.